This book has been sitting on my shelf for about 10 years. I finally decided to pick it up and read it. 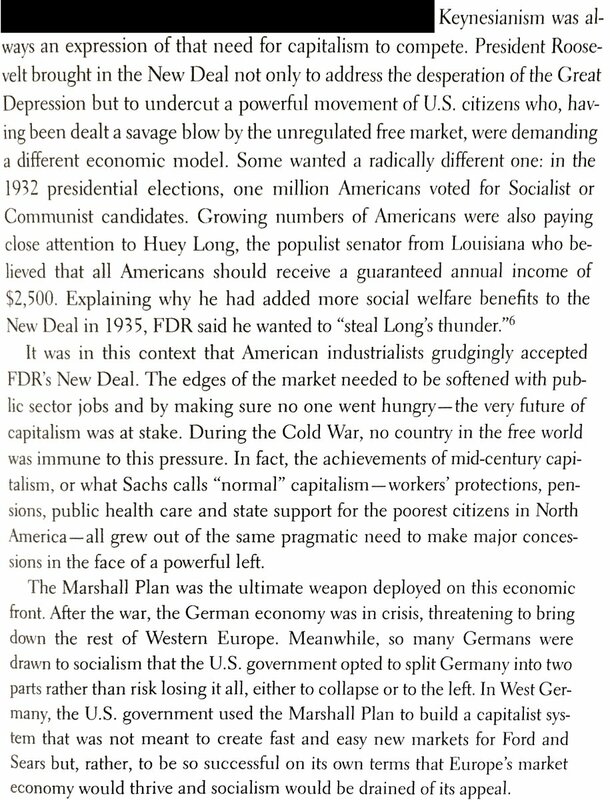 The Shock Doctrine by Naomi Klein. Beginning in the 1970’s in Latin America, Neoliberals from the Chicago School of Economics, following the ideology of Milton Friedman and Friedrich Hayek began to influence (experiment with) the economies of countries in the Southern Cone. Chile, Argentina, Brazil, Bolivia. These concepts are in stark contrast to developmentalism and the ideas of John Maynard Keynes. Keynesian economic theory is best captured in the policy of The New Deal under Roosevelt (in the U.S.). And more recently in the government spending that brought the country back from the Great Recession in 2009-2009. The government is spending capital to build social programs and spur economic growth. It worked during the New Deal and it worked under the Obama administration. Klein’s premise is that free market capitalism based on Neoliberalism is incompatible with democracy. It is based on the concept of a clean slate – in the context of a nation state, it means that the existing economy and political landscape is wiped clean and new economic policies are introduced. Historically these policies need to be backed up with force – thus the dictatorships in Latin America. Her theory is that the introduction of these free market policies are best introduced following a shock to the culture where the population is disoriented – and neoliberal policies are instituted upon an unwilling (and uninformed) population. (Remember Shock and Awe in Iraq?). The idea is that the existing order is completely disoriented. Order being the existing political body, the economy, the general population. She begins the exploration of the parallels between shock therapy on an individual scale with the experiments in the 1960’s in Montreal (funded by the CIA to counter the belief that Cold War spies were being brainwashed). These experiences were effectively torture experiments to determine if a person could be psychologically wiped clean and regress to a infantile state where they can be easily influenced. The output of these experiments led to the creation of the Kubark manual of interrogation. This sound hugely conspiratorial – but Klein does a great job through most of the book in weaving a coherent narrative from the repressive dictatorships of Latin America (Pinochet in Chile) to the fall of the Soviet Union to apartheid in South Africa and the debacle of the United States occupation and failed reconstruction in Iraq. Neoliberals have been trying to roll back social programs b/c they feel they’re … socialist. There has been a conflation of “freedom” with “free market capitalism”. Free market capitalism is not equally distributed across a population. laizzez-faire, free market capitalism benefits those in power and leads to vast differences between rich and poor (we’re seeing this in the US right now). The economy of Sweden is the antithesis. Open democracy, capitalism balanced with social programs. This is what’s know as “the middle way”. the multinational overlap in neoliberalism is a resource grab. All operations of the state should be privatized, multinationals come in and export profits out of the country. Interestingly, Russia did not do this and thus the oligarchs were established after the collapse of the Soviet Union. The war in Iraq was an abject failure of neoliberal policies, yet no one was held responsible for destroying the country. (I could go deep into the irony of the current administration blaming the former administration to spawning ISIS, but I’ll stop. The destruction of Iraq was primarily an economic failure – that led to a political failure, that led to where we are now. Many developing countries are wising up to the IMF and World Bank. They are effectively lending mass sums of money to countries in exchange for opening up their markets to deregulation and privatization. There’s a lot more to the book that what I’ve noted. I found the historical context of the US’s involvement in Latin America fascinating. It also allowed me (in reading the book 10 years later) to form a cohesive timeline of how neoliberalism contributed to the current situation in the middle east. There’s a great chapter toward the end of the book about the homeland security industry and the Israeli technology sector.